Belgian dark chocolate filled with a rich, silky fondant creme. Delicate chocolate ganache centre with the amazing tang of fresh raspberry. Hazelnut, Honey and white chocolate, combine to make a heavenly filling to a 60% Dark Chocolate shell. A soft smooth chocolate with a mix of nuts and fruit. 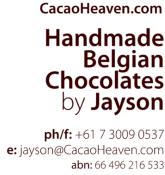 Chocolates are available either in batch quantity or in gift boxes of 6 or 8.